My day started perfectly; maybe the whole day was perfect, in fact. I woke up, alone in my room in a pension in a quiet corner of Santiago- not needing to worry about my alarm bothering anyone, not needing to worry about making noise or keeping my things contained in a tight, small space. I could get changed in my room and not in a cramped bathroom stall, I could brush my teeth in peace. Packing my bag is now so routine that I can do it quickly; I was out the door and into the cathedral square in no time. The square was quiet, only a few pilgrims were standing there and looking up to the cathedral. I went to the far end of the square and took a seat against the wall and hoped that I hadn’t missed Christine. I was ready to head to Muxia, and I had a long 40km ahead of me. Already it was almost 8am and normally I would have already been walking for an hour. But trying to find Christine was worth the delayed start. And just when I thought I missed her she walked into the square. She came from the wrong direction- not on the Camino- and I knew she had already been to the square and had probably gotten her compostela. She was walking slowly, looking around, smiling at other pilgrims, still carrying that enormous green pack and her two very worn walking sticks. I walked over, reaching out to touch her arm. When she saw me she blinked and said, “Ce n’est pas vrai.” I’m sure she expected that I would be on my way to Muxia by now. We embraced and took a photo and went to find a bar to have breakfast. Our conversations have always been pretty basic, since my French isn’t so good, and this morning I wished so much that we could speak more easily. I had so many questions for her: what it felt like to be in Santiago, what it felt like to end this journey, was she happy or sad or overwhelmed or tired? We talked about some of this, and Christine seemed more subdued than usual. But in the end she told me that she was happy- she was in Santiago, she had seen me. We walked out of the bar and to a corner where we would head in different ways- we hugged again and I struggled to not get too emotional, to not start to cry. 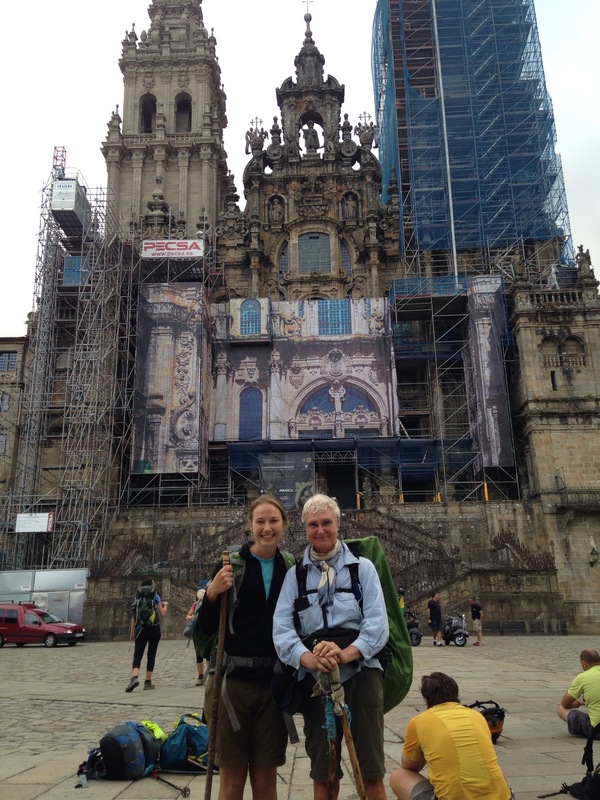 I felt full as I walked away, across the square in front of the cathedral and over to the Camino route; full of happiness and love and excitement for the next few days of walking. And just before I turned left to leave the square and walk out of the city, I saw a familiar figure standing against a wall- with his blue pack, gray cap, smoking a cigarette and holding a small styrofoam cup of coffee. It was Nicolas- of course it was, because it’s the Camino and things like this usually happen. I walked over and when he saw me he smiled. He had just walked through the night to get to Santiago, losing his friends somewhere along the way, losing himself somewhere along the way as well. “I walked- I don’t know- 60 or 80 kilometers.” He frowned, and squinted at the cathedral. 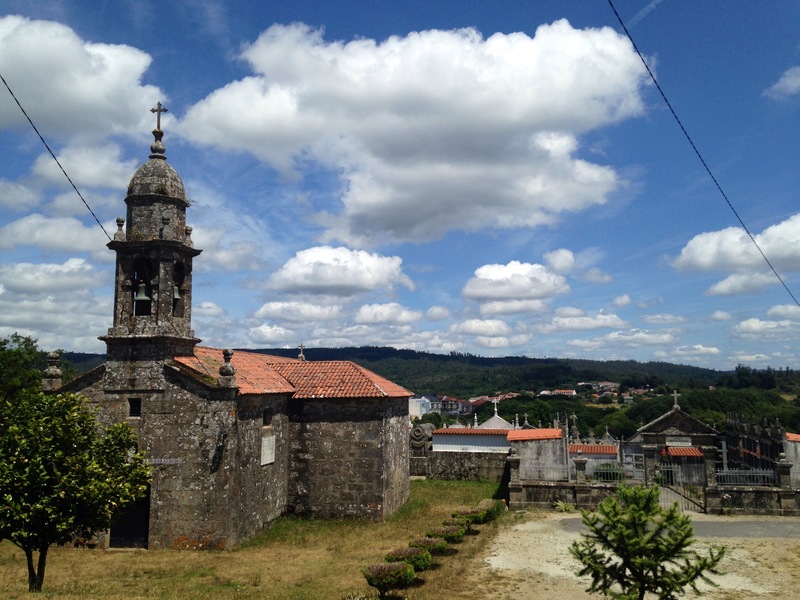 He hadn’t been looking forward to Santiago, or the crowds- he and Pierre planned to walk from Santiago down to Portugal, and Santiago was never the destination for Nicolas. I could tell that he was dazed and tired and probably wishing he were some place else. But still, I smiled at him, and gave him a big hug goodbye. Whether he was happy or not in that moment, I was happy. 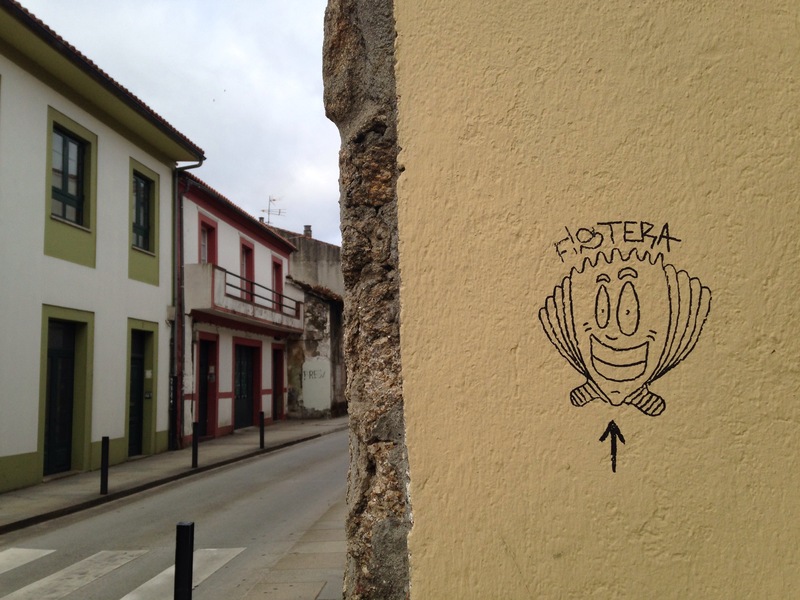 I’ve said it already, but it’s worth repeating: on the Camino you don’t often get to really say a goodbye. Last year we joked about the “Camino goodbye”, how you’d think you’d never see someone again, try to tell them goodbye, then see them a day or two later (or even a week or two later). But sometimes you don’t say goodbye, thinking it’s inevitable that you’ll run into them somewhere along the Camino, only to never see them again. It’s good practice for life- people come and go all of the time- but it’s always been hard for me to not have closure on the relationships that have been important to me. So on this Camino, seeing Guillemette the night before, finding Christine this morning, and now seeing Nicolas, moments before I was about to walk out of the city… it meant something to me. Leaving is always hard, but a hug and a goodbye help to ease that bittersweet ache. I walked out of the city feeling just that: a bittersweet kind of ache, which I think was exactly the way I wanted to feel. I WAS leaving something behind when I left Santiago- I was leaving people and connections I had made- but it was right to leave. This was the end, and leaving was always going to be hard. But today’s walk? Oh man, it was great. It took me a little while to get going, and for a lot of the first 20 kilometers, I could feel the effort it took to walk up the hills, I could feel a constant hunger in my stomach (despite the multiple coffees, croissant, toast, banana that I had eaten). 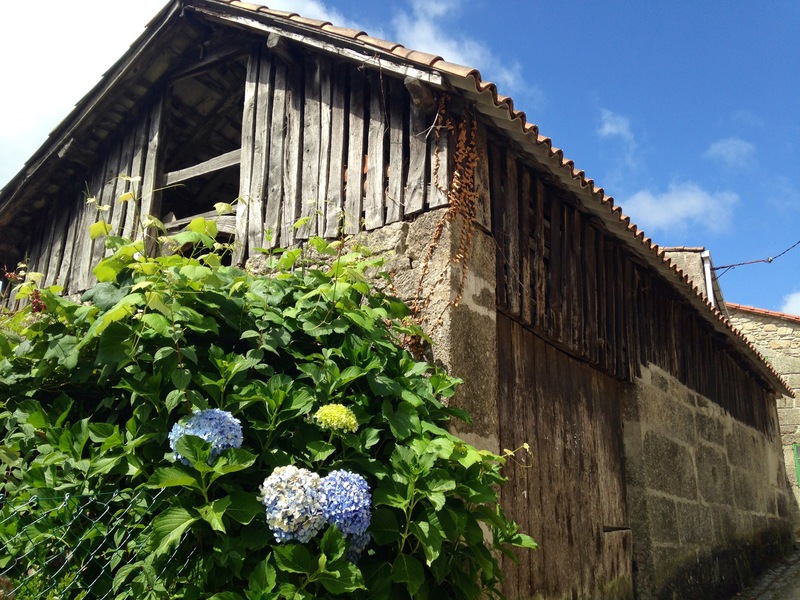 So after I arrived in Negreira, the typical first day stopping point for many pilgrims on the way to Finisterre/Muxia (and where I myself had stopped last year), I found a place to eat, and settled in for a nice, long lunch. Last year, my friend Sonal and I had eaten here- a bar/restaurant just across the street from our albergue, and I had been amazed at the quality of the food. It wasn’t typical for the bars I usually stopped at in Spain: inside, this one had a saloon type feel, with big wooden booths, a few pool tables in the back. 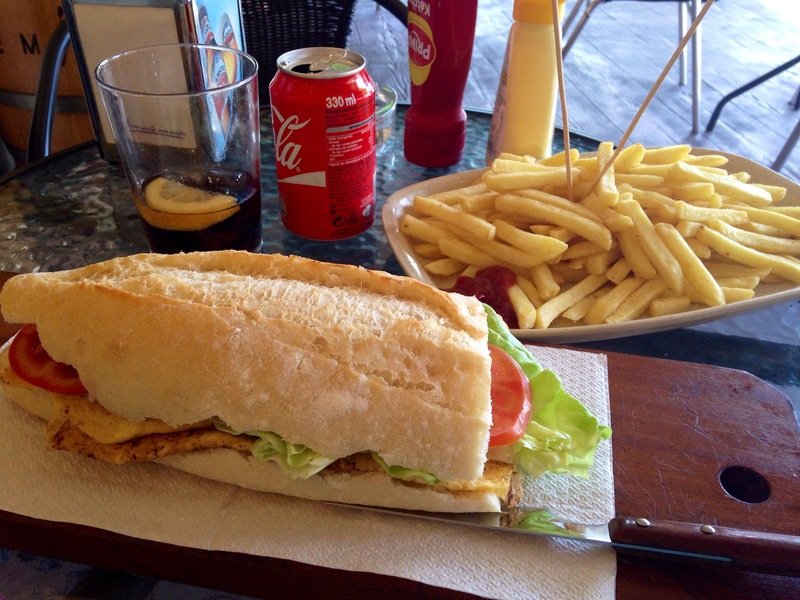 Last year I’d eaten an amazing bocadillo (sandwich), and I ordered one again this year, along with a plate of fries. The food that was delivered to my table made my jaw drop: I’d only ordered half a sandwich but the thing that was placed before me was larger than most full sized bocadillos. I laughed at all of the food, the woman who brought out my food laughed with me, and then I dug in. It had taken a long time for the food to come out so I was at that restaurant for nearly an hour- sitting at an outdoor table in the shade, my shoes and socks off, writing postcards, sipping my coke, munching on french fries. When I finally left, I felt so satisfied and energized, that I knew it would be no problem to keep walking. Just as I was on my way out of the city, a young man stopped me. He looked like a pilgrim- one who had already checked into his albergue and showered- and he warned me that the municipal albergue was already full (this albergue was outside of the city, so I think he was trying to prevent me from walking out of the city only to have to come back and look for another place to stay). He laughed and shook his head a little, then wished me a Buen Camino. And a buen camino it was. That sandwich and french fries and long break powered me through those 13 kilometers. It was a late day- when I left Negreira it was already 3:00, and on the very outskirts of the city was a marker that said Muxia was 65 kilometers away. I tried not to think too much about it- 65 kilometers was an awful lot to walk between now and tomorrow- and I pushed on. Once again the sun was out and the afternoon was hot, but when I arrived in Vilaserio, 13 kilometers away, I still felt good. A pilgrim sitting outside a bar waved me over and said I would need to go inside the bar to check into the private albergue, if I wanted to stay. I lingered there for a minute, and a few other pilgrims started talking to me. One was an American girl, the other a German guy. The German wanted to make it to Muxia tomorrow as well, and was considering walking further that day. The American girl was staying. I stood there, leaning on my stick, telling the others about the long days I had walked. “You’re crazy!” they said. I knew it was crazy, but I was still feeling good. And I wasn’t sure whether to keep walking or not. It was nearly 6pm, and I had another 7km to go before the next albergue. It could walk it tonight, arrive late, and only have about 40 kilometers to walk tomorrow… or I could stop now, shower and sit at this bar with these friendly pilgrims, and have 52 kilometers to walk tomorrow. So I decided to stay. And I’m so glad I did, because it was a great Camino night. After settling into the albergue I sat at the bar with a drink and talked to Juliette, a woman from England. Together we walked over to a place just down the road that was offering food and drinks (it’s hard to describe this place; I’d actually stopped there last year for a break during my walk, and I think described it as a little oasis: it’s a family’s home, and they have this beautiful outdoor space for pilgrims: picnic tables and adirondack chairs and hammocks. They cook food in their kitchen and they told us, this year, that they hope to soon open their own albergue). When we arrived the American girl, Meredith, was sitting there, along with a guy from the Czech Republic, Honza. I’d seen Honza on my walk that day- he’d left Santiago just before I had, and for most of the morning was just ahead of me. We settled into comfortable chairs on the outdoor terrace, and stayed there for hours: eating salad, soup, bread, their house-made wine (the owner of this place warned us about the wine: “Be careful,” she said, “It is strong!!”). Juliette wandered in and out, but Meredith, Honza and I stayed and talked. Like so many people you meet on the Camino, these two felt like my friends in no time. Eventually we were joined by a group of Italians, and a guy and girl from Denmark. 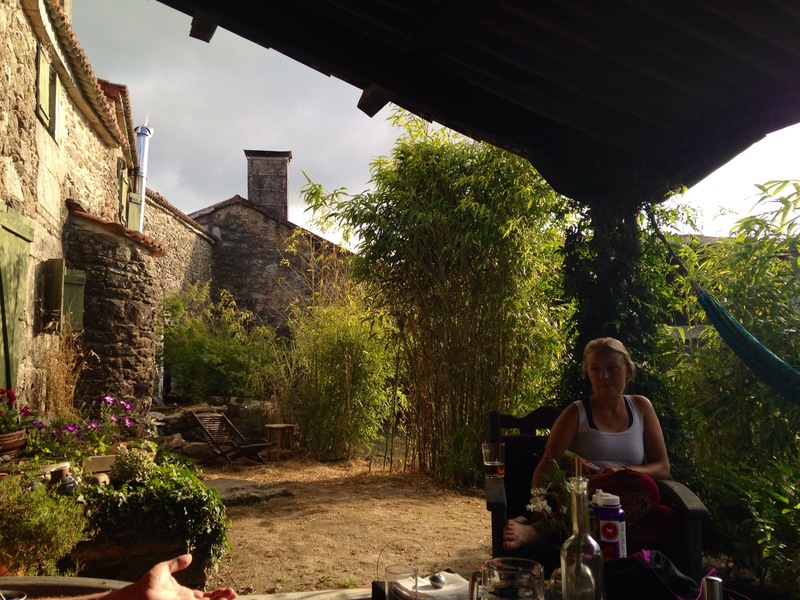 Everyone pulled up chairs and sampled the wine and talked about the end of the Camino. It was such a beautiful night- we sat until the sun went down and the stars came out. I knew that I should have had an early night- I wanted to get a really early start for my 50 kilometer day- but it was just so hard to leave that terrace. The others knew about my plan to walk to Muxia the next day. Meredith and Honza both seemed intrigued. “You’re maybe inspiring me to try to walk this,” Meredith said. “Yes,” Honza agreed, “It’s an interesting thing to consider.” We laughed, we finished our wine, we walked back to the albergue. 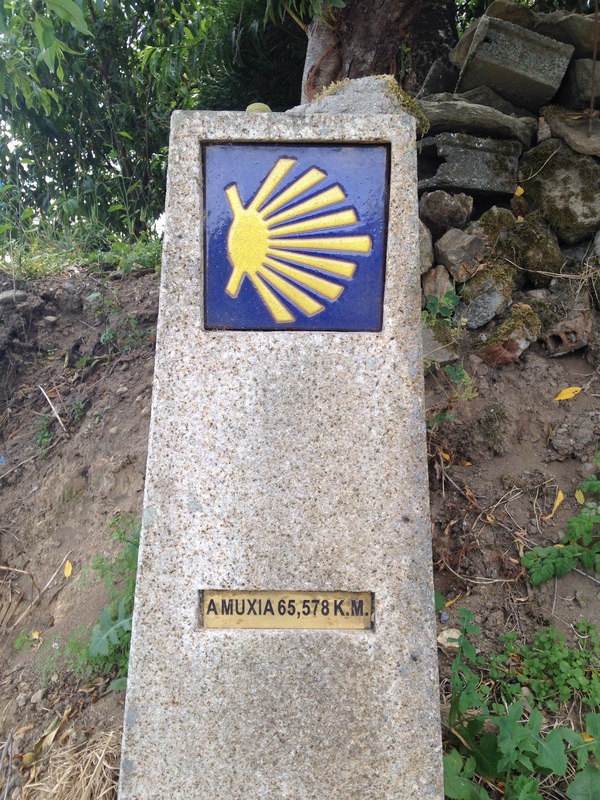 I marveled, again, at how amazing the Camino is: I’d left Santiago, leaving everyone I knew behind. But within just this one day I’d found people to sit with and eat with, to talk with and laugh with. It was such a beautiful day, and such a beautiful night. My word you are very fit Nadine. 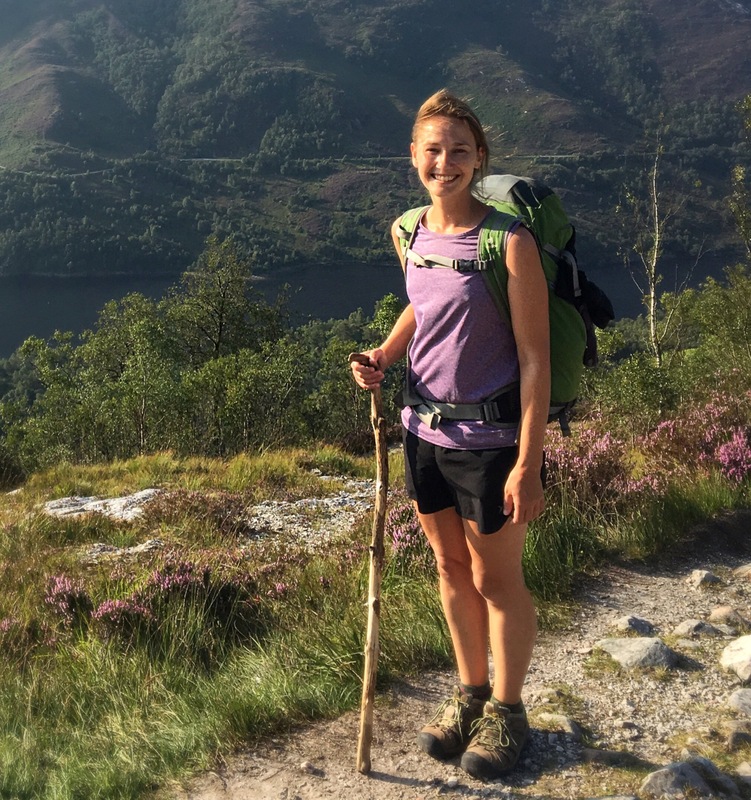 I have been thinking about this young, fit and lovely girl walking the camino as I lie in bed in freezing South Africa and wishing I could meet up for a few kilometres! I STILL miss some of the connections I made last year even though it may have just been for a day or two! And I struggled with detaching myself when friends walked on ahead and I knew I wouldn’t see them again. Its weird to think they are out there somewhere on our planet, carrying on with their lives. Buen Camino! I am dying to be back on it even more after reading this…though I do relate to Nicolas and his not wanting to deal with the crowds 🙂 I’m glad you got closure and Santiago as what you needed. On to Muxia! Just lovely, Nadine. I hope the coastal “ending” is a good one too. Buen camino.